We are in the process of overhauling our support for ads-related filters with a focus on filters that are clear, understandable, and accurate. In the past, ads-related filters available for creating lists and building workflows could be somewhat confusing. The filters’ names did not always clearly communicate what they represented, and many of the filters required you to figure out some technical details -- like an ad set ID number. To make it easier for you to create a list of contacts based on their interactions with your ads, we're updating our ads related-filters, and removing some filters from the tool. Here's what you need to know. With this change there will be three different scenarios to keep in mind. Filters that will automatically map over to new filters after the change. Filters that are no longer supported and there is a simple way to edit your lists and workflows to get the same result. Filters that will no longer be supported. Let's walk through each in turn to make sure that you are prepared for the upcoming changes. 1. Filters that will automatically map over to new filters after the change. For the following filters, there is no action that you need to take. Once we update our ads list filters, the old filters will automatically be updated to reflect the new filters. The names of the filters have changed to make them more intuitive and accurate. The old filters map to the new filters according to the below chart (the corresponding network is assumed in this chart. 2. Filters that are no longer supported and there is a simple way to edit your lists and workflows to get the same result. To filter a list of contacts who converted on your ads combine ads interaction filters with form submission filters. This new filtering system will be as accurate as the old "Conversion" property, but more clearly represents the criteria used to create your list. 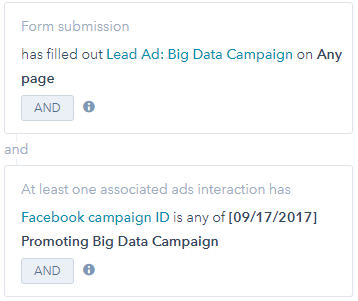 For this filter, you'll want to use the form submission filter and select a specific Facebook Lead ad or LinkedIn lead gen form to generate a list of contacts who submitted that form on any ad. 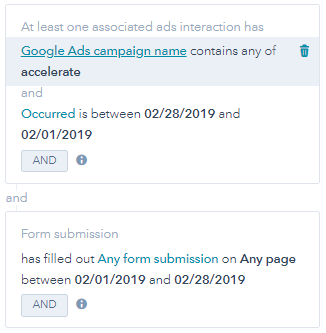 You can combine the form submission filter with the ads interaction filter to create a list of contacts who converted on your lead ad for a specific campaign. To create a list of customers who interacted with one of your ads and are within a specific lifecycle stage, simply combine the ads interaction property with the contact property filter for lifecycle stage. 3. Filters that will no longer be supported. You'll also notice that not every property previously available is available today. Below is a list of filters that will no longer be supported. These filters were infrequently used, and in an effort to provide you with more accurate and easier to use list filtering options going forward, we have decided to focus on the filtering options listed above. Updates to your ads list filters will affect both your lists, and workflows. The following timeline explains when each change will go into affect. Tomorrow (March 22), the supported LinkedIn ads list filters will be useable within your lists tool. 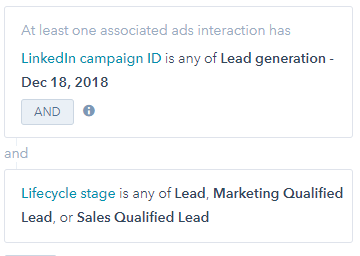 If you want to create a list based on LinkedIn ad interactions, you will need to use these new filters. We'll also begin to progressively rollout the list filters for both Google Ads and Facebook Ads. Although LinkedIn list filters will be useable within the lists tool, you will not be able to use them within the workflows tool at this time for enrollment criteria or if/then branch logic. Otherwise, the current experience for ads filters in workflows will remain the same as before. Over the next two months, old list filters, in addition to old workflow filters, that match up with a corresponding new list or workflow filter will be automatically matched, and moved into the new filtering system. Any old filters that will no longer be supported will continue to works as expected at this time. On May 20, any old filters that are no longer supported will stop working. Prior to May 20, we ask that you take action to ensure that your list and workflow ads filters are updated to reflect the new set of supported ads filters. These updates are meant to ensure that the ads filters in your lists and workflows are not only simple and easy to use, but also accurately reflect the interactions your customers have had with your ads. If you have any questions, or need help implementing changes to your existing lists and workflows, please do not hesitate to reach out to Support, or your HubSpot point of contact.